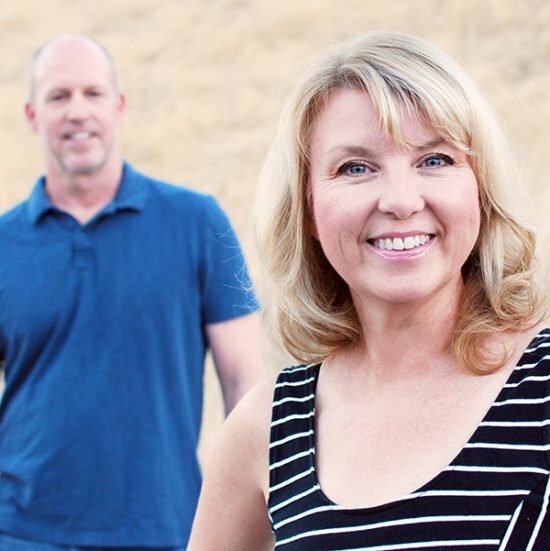 Unless your yard and garden is perfectly flat, chances are at one time or another, you’ve thought, “wouldn’t some garden steps be nice there?” Or even more ambitiously, outdoor stairs? Steps and stairs make getting around the yard easier, of course. 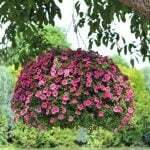 But they also lead the eye through the garden, and give it structure. You can add DIY garden stairs to your yard with these tutorials and inspirational ideas. Walk around your garden and evaluate… what space could be made better by even just 3-5 garden stairs, and what slope could be transformed into usable garden space? Check out these ideas! Our first project is from ‘2 Minute Gardener‘. This tutorial on making landscape timber garden stairs helps guide you through this project. Additionally, be sure to read through the comment section for some more tips. They recommend these type of substantial outdoor stairs for a larger property, or a large slope. 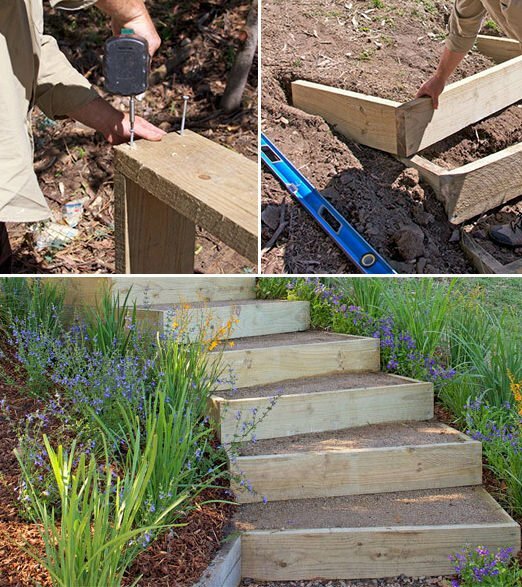 From ‘BHG Australia‘ learn how to build outdoor stairs. 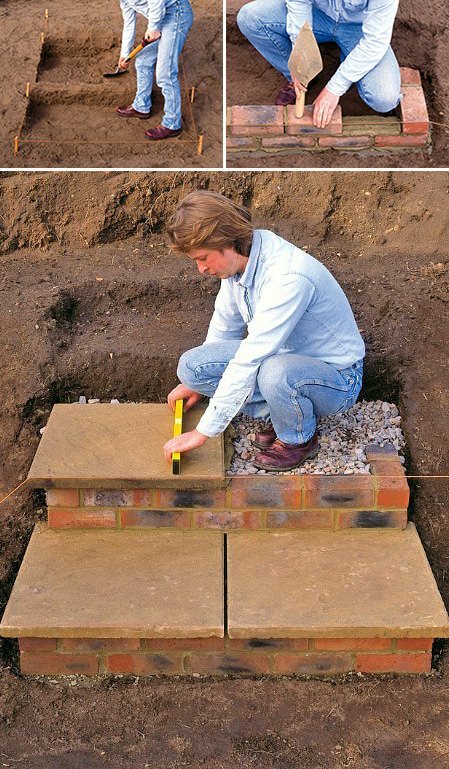 This is a similar project to above, but the directions and materials are a little simpler, and probably better for the average size yard. Lots of step by step (no pun intended!) photos! From ‘Pinterest‘, this homeowner also used brick trim on the edges of these concrete DIY garden steps to add interest… Details count! 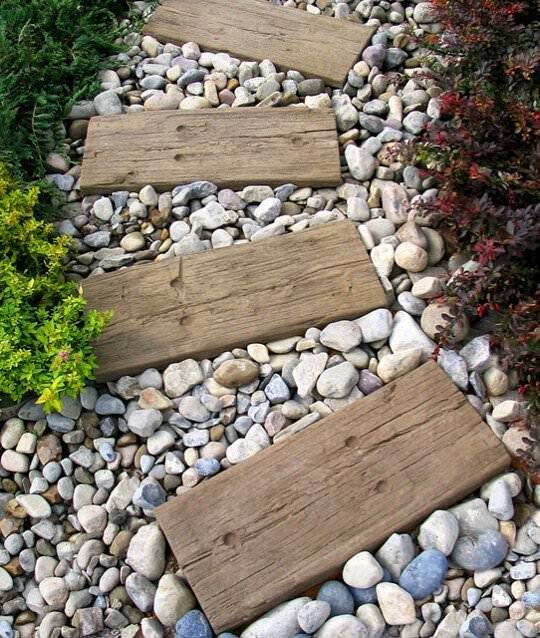 Railroad tie steps have long been used by creative gardeners, but have had some controversy as of late. Nico Lock has a maintenance free version of the “ties” that can be used in garden construction of DIY garden steps or outdoor stairs. From ‘Houzz‘ via ‘NicoLock‘. 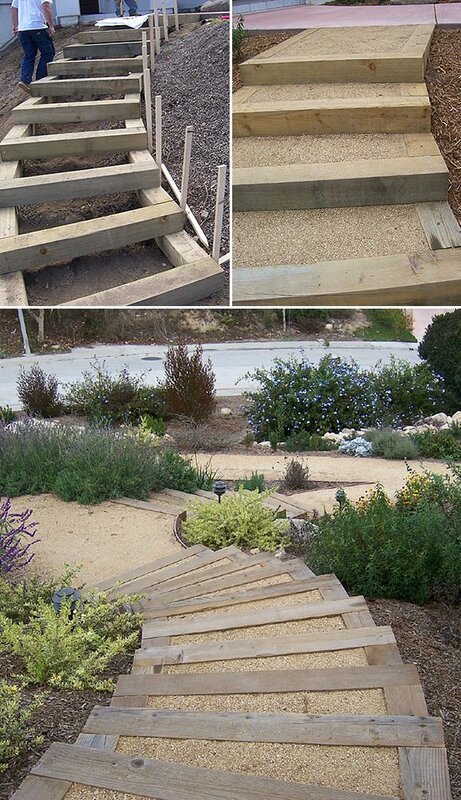 Recycle old timbers and make something like this hillside sidewalk and outdoor stairs from ‘Ohio Thoughts‘. They decided to pour concrete in each step, but also considered pea gravel. 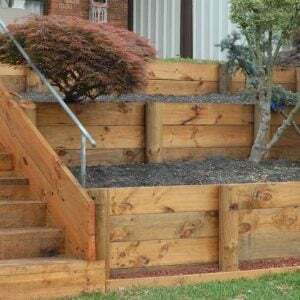 Lots of personal experience and instructions from this site on how to build outdoor garden stairs. 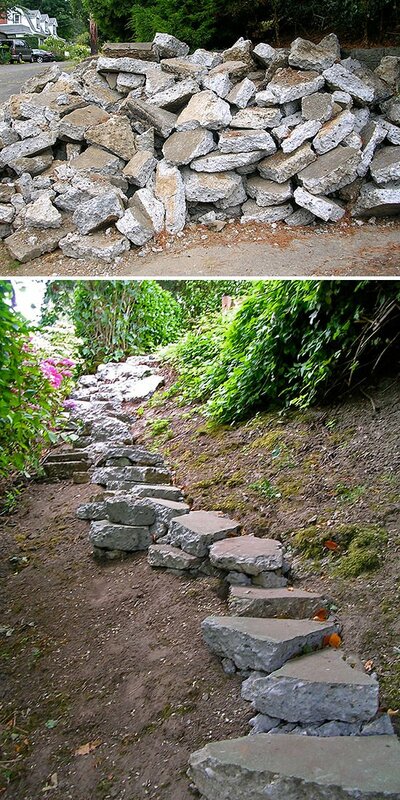 Another example of recycling, using broken concrete to build outdoor stairs, from ‘EnviroMom‘. This isn’t a complete tutorial, but a great idea that DIY’ers could take inspiration from. Want to use stone slabs? 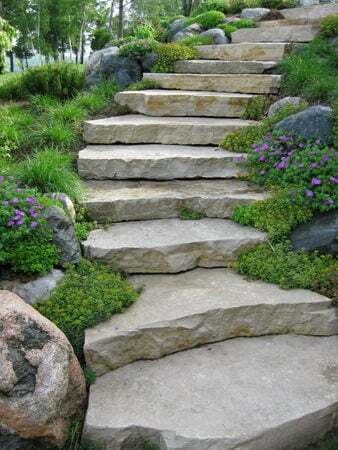 I’ll be honest, I love outdoor stairs from stone. But no lie… you need a professional for this job. And a tractor. 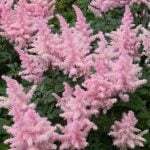 :) From ‘Robinson Landscaping‘. 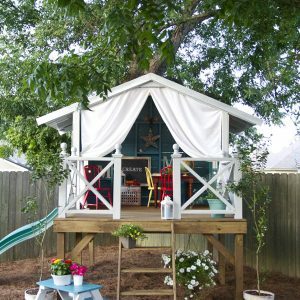 Already have stairs in your garden, but they are just too boring? 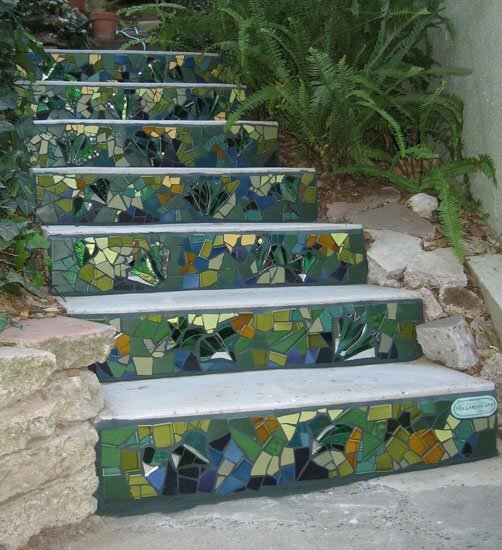 Take a cue from artist ‘Kim Larson‘, and create mosaic stairs! 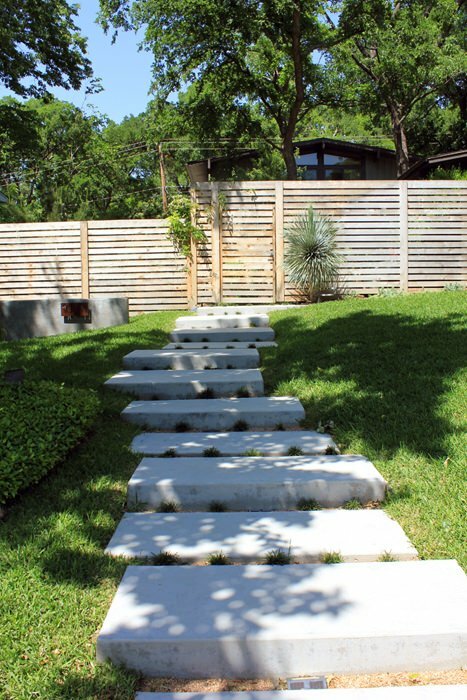 Finally, from ‘One Specialty‘, use concrete slabs to create a contemporary look with these floating concrete DIY outdoor stairs. We hope you loved learning about and getting inspired by our post on DIY Garden Stairs! We know you will also love our posts on DIY Garden Paths & Walkway Ideas or 9 DIY Patio Flooring Ideas! Masonry steps and poured concrete with a base or a footing. Two years before it starts breaking, max. Made a set of steps with two cement slabs 2ft square and supported the back of the slabs using a brick where the slabs came together. It looked great for one year then the brick moved due to frost heaves and erosion which caused the slabs to cave in at the parting line on each step.. we will reconstruct them using a pored base for the back of each slab which will tie them together. Crushed rock or gravel will not work in frost prone areas. We have a cabin on a bluff with many steps leading to lake made from railroad ties and dirt . They become moss filled and slippery because of all the trees on property. Any suggestions on filling in steps with maybe cement and pea gravel to roughen them up? I have a large slope that had old railroad ties standing upright as the steps and they were very deteriorated. There were about 15 steps. When my husband removed them it was basically straight down, meaning there wasn’t any dirt layers that they were on. He framed it in with long beam ties and rebar spikes and filled with rocks/gravel. On top of it he put bricks. Needless to say it didn’t last long before it started to fall apart. We would like to replace them and start over. How would you make new steps when there isn’t any dirt underneath them? You might want to ask a liscenecedh contractor for advice, its usually free to get a quote. In our opinions, ufortunately without taking rebar down into the rock layer way below (expensive engineering!) the only way we know of is to have dirt brought in. You might want to address if there were any drainage problems that caused the dirt to wash away in the first place? Anyone else out there come across this problem and can offer their take? I love the steps but have very limited assets. Which steps are the most economical. Wooden steps are probably cheapest initially, but concrete with last over time so may be the better long term value… Hope that helps! Thanks so much for sharing! Garden steps are lovely, but I’ve struggled to find a design that has worked for me. 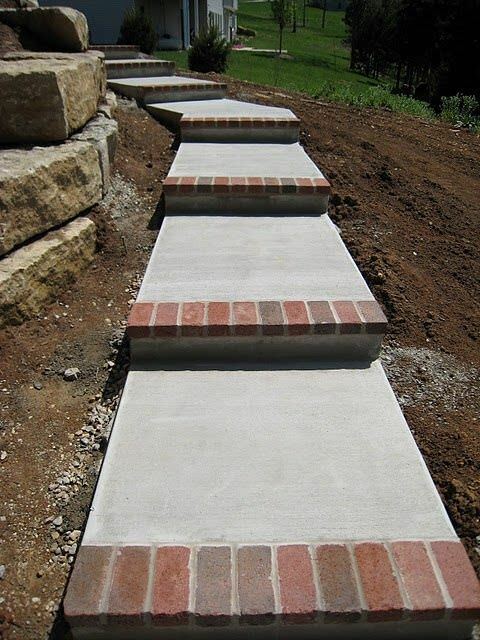 I don’t really like working with concrete, so the BHG steps you shared here look like a great option. 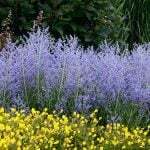 Can’t wait for spring to give some of these a try. Thanks again for sharing! Hi Kathy, these concrete steps and stairs projects are beautiful! I love the wooden outlined concrete steps and the concrete steps with the mosaic design! I would have never thought to do that? 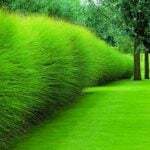 I agree about turning a slope into a usable gardening space. Very brilliant! really beautiful, i wish , i could place a stairs on my garden, but i have small space on it. I was looking at your article from last year about the 13 different garden benches. Very nice. However the very first bench, the lead picture, does not have any instructions – that is the one with the stepped blocks and the wooden seat. I was wondering if you had details on this, or should I just use my own ideas to make it. It has the advantage of simplicity which is why I am interested. Yes, you would have to take the idea as inspiration and make the blocks yourself… Wouldn’t be too hard… This one is my fav too! All of these steps look amazing!! These were all great but the first one with the rock’s shows nothing to stop the rocks from going under the riser to the next step below or did I miss it ? No, you didn’t miss it. The rock will fall down under the risers on all the steps. Once the entire void is filled, the steps will be tamped and leveled out.